Whatever the nature of your project – whether it be building a mineshaft, covering tunnel walls, building underground structures, or filling – Fournier can provide the concrete to meet your needs at extremely competitive prices. We care deeply about the quality of our products and use only high-performance materials. We are constantly seeking out the latest technologies, and our R & D lab is constantly innovating to provide you with the best product on the market. 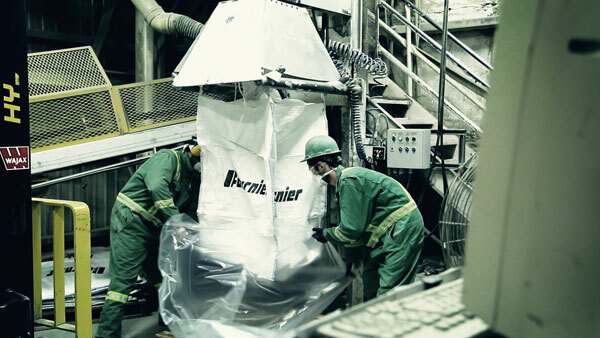 It is a point of pride at Fournier to ensure fast, efficient delivery of our products 24/7. Our technical department is also available to assist you with your project. We are committed to environmental excellence, and we make every effort to limit the negative effects of our concrete or aggregate production activities. For over 30 years, we have enjoyed a reputation in the mining industry for our knowledge of concrete and our command of cutting-edge techniques, both on the surface and underground, and in all types of conditions, especially in northern environments. In operation since 1979, our permanent concrete plants have enabled us to develop substantial expertise in specialized mining concrete. 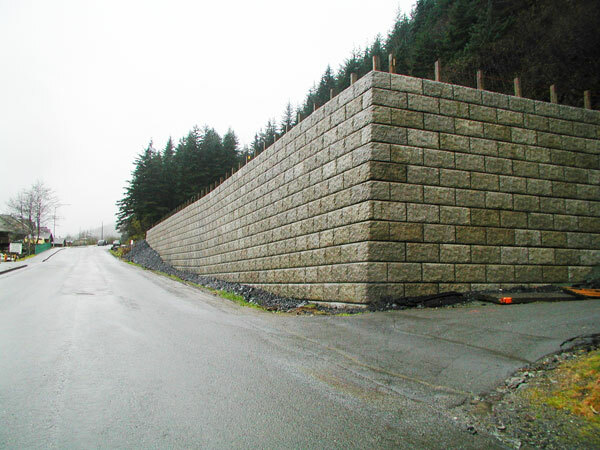 This includes the use of concrete at depth and in northern environments, and the use of shotcrete. We serve the entire Abitibi-Témiscamingue region. If your needs extend outside the region, we have mobile concrete plants of various capacities that can meet a wide range of needs. We have several mobile plants that can meet a wide range of needs and adapt to factors such as setup and takedown time, flow capacity, and mixture complexity. Our mobile plants have been successfully mobilized on a number of large-scale projects, and our experienced team is accustomed to adapting to the different circumstances and changes that inevitably occur over the course of a project. We have a stringent quality control system that takes into account the special characteristics of remote or Arctic regions. We offer a wide range of conventional concretes suitable for a variety of different projects. These high-performance concretes feature excellent placement and finishing quality, and workability is adjusted to site-delivery requirements through the careful selection of additives. Setting time can also be shortened or lengthened as needed. Our extensive experience in underground mining has led us to design a range of self-consolidating concrete (SCC) products that feature both stability and high fluidity. With a granular skeleton maximized down to the micrometre, these concretes will flow freely through vertical piping to depths of up to 3 kilometres. The formulas of our SCCs allow them to be delivered to inaccessible areas or to highly reinforced forms without the need for vibration. Adapted to the harsh realities of underground construction, our SCCs are stable in terms of segregation and setting time to ensure user safety and to protect delivery infrastructure. We can adjust the fluidity of our SCCs to a spread of between 500 and 800 millimetres without segregation, while maintaining a very low water-cement ratio. Their final compressive strength can reach over 35 MPa. Our wet-mix shotcretes are the result of many years of research and development and have proven themselves on many projects, both at the surface and deep underground. They are suitable for all applications – inclined, vertical, or overhanging horizontal surfaces – and they can be used for structural reinforcement and for protection or repair of both abraded and smooth surfaces. Our shotcretes have been formulated to maximize placement (better surface adhesion, increased application thickness per pass, less rebound). Depending on the project, slump can be adjusted from 50 millimetres to a spread of over 650 millimetres. When delivered underground through vertical pipes, our liquefied sprayed concretes are stabilized in terms of segregation and setting time to ensure user safety and to protect infrastructure. Their final compressive strength is over 35 MPa. Fibre can be added to all of our concretes. We have several types available – from microfiber to synthetic or steel macrofibre – each suitable for a specific application. Depending on the amount used, fibre can help prevent cracking from plastic or drying shrinkage. When added in higher amounts, fibres provide structural reinforcement that in some cases can replace light steel rebar. If cracking due to external pressure is an issue, the use of fibre can limit expansion by holding the concrete together. The fibres we distribute have excellent anchoring in concrete, meaning the concrete can withstand significant distortion loads. In addition to its ability to limit cracking, fibre can be used to reduce abrasion damage on high-traffic surfaces such as garage floors or in mine raises and underground silos. Our fibre-reinforced concretes feature excellent pumpability and workability. We have developed an assortment of lightweight concretes with densities ranging from 400 to 2,000 kg/m3. Our lightweight concretes are suitable for numerous applications, such as backfilling, thermal and acoustic insulation, surface levelling, and building lightweight concrete structures. 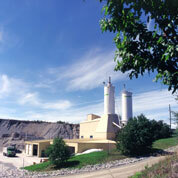 Some of our mixes have even been designed for construction at depth (> 2,000 m). These lightweight concretes for underground construction have sufficient fluidity and stability to be delivered freely through vertical pipes. 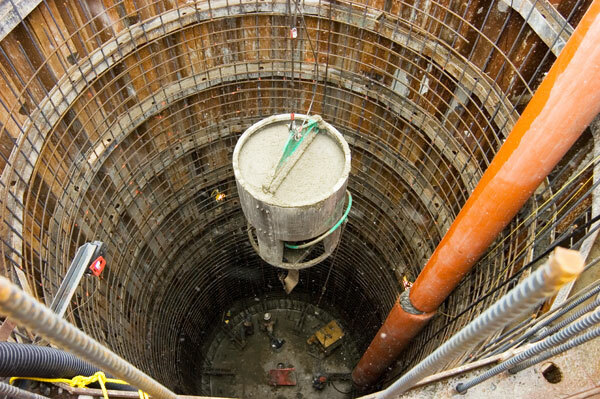 Replacing some of the solid components with stable micro-bubbles of air helps reduce the cost of concrete delivered underground compared to self-consolidating concretes, which are generally used when compressive strength is less critical. Whether at the surface or underground, our lightweight concretes feature excellent pumpability and workability. Our mass concretes are the ideal solution for building very large structures, in which the heat produced by hydration becomes critical. In such structures, the heat produced creates a significant temperature gradient between the interior and exterior of the structure. Such temperature gradients can lead to major cracking and compromise the integrity of the concrete structure. We have therefore designed concretes with low heat output that help to control these gradients. Our mass concretes can be prepared for a variety of different final compressive strengths, and they can be formulated with a standard slump rate or with high fluidity for placement without vibration or delivery underground through vertical piping. We offer a wide range of conventional bagged concrete suitable for a variety of projects. These high-performance concretes feature excellent placement and finishing quality. The cements, aggregates, and additives are measured and mixed with precision in our ISO9001 and NQ 2621-905 certified bagging plant, guaranteeing consistency from one bag to the next. Setting time can be increased or decreased according to specific needs. We also carry different bag sizes, ranging from 30 kg to 1000 kg, or 1 m3, with or without delivery spout. We also have a number of mixers designed especially to maximize productivity, guarantee mix quality, and ensure user safety. 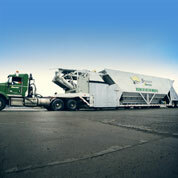 Our mixers can be quickly and easily moved to remote locations. GATORPASSTM: an abrasion-resistant shotcrete of unparalleled value for the price, and for protecting and repairing ore passes, hoppers, silos, and any other high-use structure. PUR concrete: shotcrete that reaches high compressive strength very quickly, designed to considerably reduce turnaround time. Arctic concrete: shotcrete designed especially for northern environments (<0 °C), where low temperatures usually restrict the use of conventional shotcretes. Our shotcretes have proven themselves on many projects, both on the surface and underground. They are suitable for all applications – inclined, vertical, or overhanging horizontal surfaces – and they can be used for structural reinforcement and for protection or repair of both abraded and smooth surfaces. Our shotcretes have been formulated to maximize placement (better surface adhesion, increased application thickness per pass, less rebound). 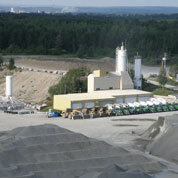 We control all production stages, from aggregate sieving to bagging, guaranteeing consistency from one bag to the next. This is particularly important for shotcrete, where accuracy of grain size is essential to maximizing adhesion. We can vary a wide range of additives (accelerators, air-entraining agents, waterproofing agents) to adjust the characteristics of our shotcretes. We can also provide premixed bagged concretes for wet-mix shotcrete. Arctic grout: a fluid grout for anchoring posts and bolts in bedrock, designed for Arctic environments. It provides high initial strength at temperatures as low as -10 °C. Malkovsky grout: a thixotropic grout that moves from a fluid to a plastic state very quickly when agitation ceases. The product was designed so that this transition can be reversed by applying mechanical force. It is particularly useful for limiting overflow when injecting onto overhanging spaces. Non-shrink grout: a grout whose initial volume remains almost constant after setting. Non-leaching grout: a grout based on the characteristics of non-leaching concretes used in underwater environments. It is designed to limit potential leaching loss from post-injection water infiltration. In addition to these specialty grouts, we also have grouts adapted for different site and production conditions. Depending on your needs, we can incorporate different types of cement into our GU, HE, Low Heat, high early strength, and ultrafine grouts. We can also adjust the characteristics of our grouts at the plant by selecting and incorporating a wide range of additives, such as accelerators, retarders, plasticisers, expanding agents for plastic or solid phases, air-entraining agents, waterproofing agents, and binding agents. Sand can also be added to our grouts to reduce costs or to modify other properties. We are happy to work with you to design a product according to technical specifications. We have a wide selection of precast concrete structures available in various dimensions. Depending on your needs, we can add an air-entraining agent to the concrete to give precast pieces more freeze-thaw resistance. Various types of anchors are available to manipulate precast pieces. For more information, consult our product catalogue or contact us.